Paw Print Genetics is setting the industry’s benchmark for customer service, support and communication. We strive to make ourselves readily available - you can contact us by telephone, email or social media. We also give you the best genetic testing you need to breed or buy the healthiest canines possible. Our user-friendly website is full of valuable information. It is also the epicenter of interactions with Paw Print Genetics. Through it, you can create and manage your account, track the progress of your dog’s sample in the testing process and view your final results. You can make changes to your dogs at any stage! At Paw Print Genetics, we realize that changes take place – names change (“Puppy One” becomes “Larry”), pups are registered and they may receive microchips before they go to their new homes. You can change your dog’s information prior to the laboratory receiving the your samples. Just click the edit button found on each of your dogs’ pages. After the lab has received the samples, you can still have information changed. All you have to do is submit a change request through our website and the data will be changed at no cost to you. The change request is found on your dog’s page after you click the edit button. Our staff will also update the dog’s Canine Genetic Health Certificate and you will receive a confirmation email when all the documents have been changed. Our website is also your portal for maintaining testing records, and now you can display those results and promote your kennel and dogs through Paw Print Pedigrees. 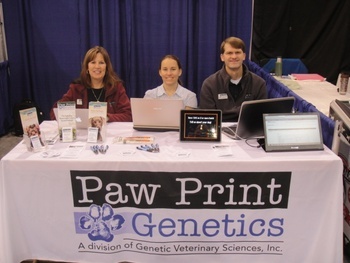 With the launch of Paw Print Pedigrees, even more customer value is included with your genetic screening. Our clients can choose whether to publish their dog’s results to Paw Print Pedigrees – our database of publicly accessible test results. It’s a great way to promote your kennel, dogs and breeding program.